The Open Mesh of the Type A 6 ensures a lightweight and breathable coverage that’s comfortable. Flex Film is a set of overlays that are inconspicuous, yet efficient in securing the foot in place, according to a few testers. The SSL EVA is a premium mid-sole unit from Sauncony that’s lightweight and very capable of providing durable support and rebound. The XT-900 is a carbon rubber material that can be found throughout the outsole unit and it gives traction to the runner. The IBR+ or Injected Blown Rubber offers additional cushioning in the forefoot area of the outsole, making sure that every toe-off is as efficient as possible. The men and women’s versions of the Type A 6 have lightweight natures. The Saucony A 6 works well for many activities, but its durability was criticized by some reviewers when taken to longer races. Others felt that the forefoot area was too narrow for them. Some noted that it was one size smaller than their regular choices. The Type A 6 from Saucony offers a lot of service for athletes who have a neutral gait. It’s lightweight, affordable and agreeable to the natural performance of the foot. It’s a solid option for mid-tempo training. Though it received a few negative feedback, the shoe has still proven to be an excellent road partner. Asics) is the lightest ‘real’ running shoe on the market. The A6 has a comfortable upper, good traction, and a comfortable slab of soft cushioning. There are several shoes on the market that are lighter than the A6, such as the New Balance RC 5000, Asics Piranha, and Saucony Endorphin racer, however, I do not consider these to be ‘real’ running shoes because they either lack traction, cushion or a comfortable upper (in some cases they lack all three). These three components, in conjunction with the shoe's flexibility make the A6 one of those shoes that you forget is on your feet whilst racing. The A6 has a very lightweight upper. The upper contains all of the components that a plush cushioned running shoe would, except in smaller proportions. The upper is made of a double layer mesh with flexfilm overlays. The inner layer of the upper is made of a very soft material for maximum comfort. Saucony cuts many small circle in this layer to keep weight to a minimum. The foot still only touches this soft inner layer which means that these cut outs do not impact the comfort of the shoe. The inverse circle structure is the strongest possible structure that an upper can have while keeping weight to a minimum, which is why many shoe companies use it in their more lightweight models. The outer mesh is less soft, stronger and very breathable. There are many Flexfilm overlays on the upper. Flexifilm is a strong lightweight plastic material that Saucony uses on many of its uppers. Saucony uses a synthetic, moisture wicking material, called HydraMax, in the entire heel area and on the bottom of the tongue. This is a very soft material that is quite comfortable on my foot. The A6 has a small, internal plastic heel cup. It comes about halfway up the shoe and wraps around the heel. This did give the shoe a little bit of extra support. The tongue has a moderate amount of padding. When I race, I like to tie my shoelaces very tight. Even when I tie the laces extremely tightly, the laces did not cause any pressure points on my foot because of the cushioned tongue. The A6 has a snug but not overly snug fit. The entire upper hugs my foot without uncomfortably restricting. Having a straight big toe is very important for running stability and power. Some shoes with narrow toe boxes bend my big toe inwards; This shoe did not. My toes do not feel cramped either. Overall the fit is perfect for a racing flat, snug but not uncomfortably so. The A6 has a very simple midsole. There is a slab of Sauconys EVA+ foam underneath the sockliner. EVA+ is a softer, more responsive version of EVA. A little bit of soft midsole material provides the same amount of impact dampening as a thicker slab of firm foam. Thinner and softer midsoles are more comfortable on my feet. Saucony (rightly) decided to use a thin slab of soft foam to keep weight down and comfort levels up. Despite the thin midsole, the A6 provides just as much cushion as heavier racing flats with thicker midsoles. The thinness of the midsole causes the shoe to be very flexible. This causes the shoe to lack a responsive ‘pop’ at the push off stage of the gait cycle. I admit that it makes the shoe feel less fast, however it makes up for this with elevated comfort levels, and reduced weights, compared to stiffer, more responsive racing flats. The flexibility makes the shoe disappear from you feet when running. There are 5 holes in the midsole, two underneath the toe box, and three underneath the midfoot. There are also holes in the sockliner in the same locations. These holes cause the shoe to have spectacular ventilation. It also causes your feet to get very when you run through puddles. The water drains out quickly because of the holes. The A6 has a four millimeter drop. This makes the shoe best for forefoot strikers. The thin midsole and low drop design makes this shoe uncomfortable for any pronounced heel striker. I find that at the end of a half marathon, I develop a slight heel strike. The shoe does not become too uncomfortable at this point during a race. There are three materials that are used on the outsole: IBR+, EVA+ and XT-900. XT-900 is a sticky rubber compound that provides great traction. XT-900 is used in the back of the heel and the front of the forefoot. IBR+ is another rubber compound that is much more lightweight and much more durable than XT-900. It does not provide as good traction. IBR+ is used on the outsole in the rear of the forefoot area and on the lateral side of the midfoot area. EVA+ is the midsole material, and is placed (not covered up) on the medial side of the midfoot. This design is very functional for both heel strikers and forefoot strikers. In order to achieve maximum toe off power, you need maximum traction in the very front of the shoe. Whilst heel striking, you need maximum traction at the initial contact point so that you can effectively pull yourself forward. These two crucial traction points are covered by the XT-900. The IBR+ is placed on the rest of shoe that has significant contact pressure with the ground. The lateral midfoot area is where most of the pressure is applied while heel strikers roll through their gait. The rear forefoot area is where most forefoot strikers have their initial contact point. Maximum traction is not necessary where forefoot strikers land because when they land, their bodies are already directly above their feet. Therefore, they do not need maximum traction to pull themselves forward. Forefoot strikers do need maximum durability in their landing zone because forefoot strikers do not let their impact roll forward like heel strikers. Instead, they tend to unload all of their landing impact in one spot. The EVA+ is exposed on the outsole only in locations that are generally not subject to too much abuse. 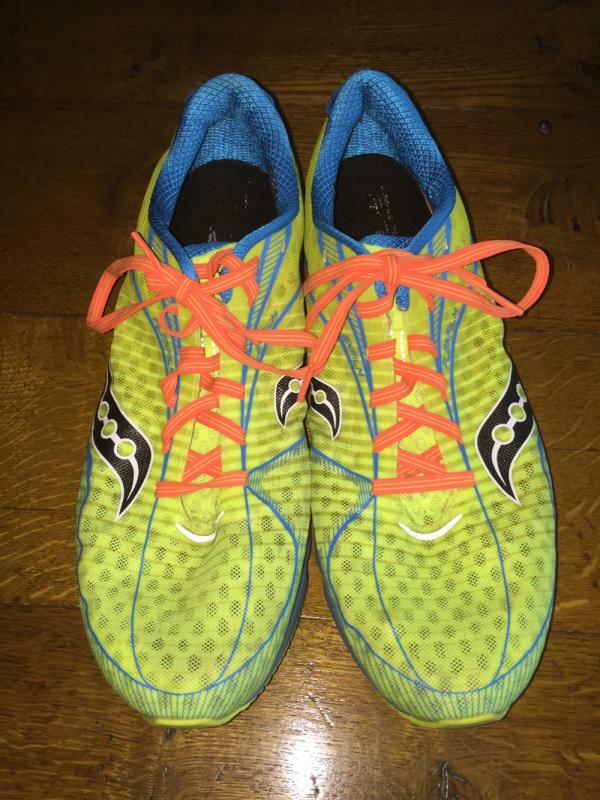 Saucony used a great design with their material placement for optimal traction, durability and weight management. This is a durable racing flat. It will last around two hundred miles of racing. The limiting durability factor is the lifespan of the midsole, not the outsole. The outsole is composed of many separate pads of rubber or foam. There are flex grooves in between these pods to give the shoe added flexibility. The Type A6 is a great shoe for any road race from the Mile to the Half Marathon. Some very efficient, fast runners have used the A6 for the marathon, however, I would not recommend using the A6 in a Marathon unless you use it comfortably in a couple half marathons first. This shoe has all of the components of a normal running shoe, just in smaller proportions. This makes it a great option for minimalist runners looking for a training shoe. The A6 works great for interval workouts, however, I do not often use it for this purpose because I like to save my favorite shoe for race day. I do not recommend the A6 on wet days because of the highly breathable design. It also does not work well for freezing weather races because the cold weather makes the midsole go stiff. Note: Shoes that run small are heavier in your size than shoes that run large. This is because all shoes are measured as a standard size 9, however you wear a larger size in shoes that run small. These two shoes are very similar. The A6 is slightly lighter than the Streak LT3. Both shoes have similar flexibility levels. The A6 definitely wins when it comes to cushion. Both shoes have about the same volume of cushion, however, the A6’s cushioning is much softer. The Streak LT3 is more responsive. The Streak LT3 has better rubber coverage and a longer lifespan than the A6. The upper on the A6 is much more comfortable and durable than the upper on the Streak LT3. Buy ½ size up in the Streak LT3. The Endorphin Racer 2 is not a real shoe. It has a very thin midsole and the upper is a single piece of plastic. The rubber on the outsole of the Endorphin is stickier than the outsole of the A6. The Endorphin has a bouncy midsole. It provides much less impact dampening, but it is just as responsive as the A6. The Endorphin is only for races up to the 10k. The Asics Gel Hyper Speed 7 is about an ounce heavier than the A6. It does provide more traction, support and cushion than the A6. The Hyperspeed is a little bit stiffer than the A6. The Hyper Speed has less comfortable upper and a 6 millimeter drop. Essentially, the Hyper Speed is what you would get if you added one ounce of material to the A6, spread evenly between the different components of the shoe. This makes the Hyperspeed more accommodative to heel strikers than the A6. The Fastwich 8 is Saucony's support racing flat. The Fastwich provides the same amount of cushion as the A6. The midsole of the Fastwich is thicker and firmer than the midsole of the A6. Both shoes have similar uppers. The Fastwich has better rubber coverage, and therefore has better traction. The Fastwich weighs more than an ounce more than the A6. Only buy the Fastwich if you overpronate. The New Balance Hanzo weighs an ounce more than the A6. The Hanzo has the same volume of cushioning as the A6. The Midsole is much firmer and stiffer in the Hanzo. The upper is decently comfortable in the Hanzo, but it is not as comfortable as the A6. The Hanzo has better traction that the A6. Both shoes have a 4 millimeter drop. The Hanzo has such a firm midsole, that it is not fun to run in. When I have to give the shoe a score, I think to myself, “What would I change to improve the shoe”. I would not change much about the A6. I might change the color of my pair, but there are other colorways available that satisfy this desire. Saucony will always develop new technologies that make this shoe lighter, faster, more comfortable and more durable. There is no end to possible improvement in these areas. For now, this is one of the best racing flats on the market that has no obvious flaws. Overall, the A6 is a comfortable racing flat in a lightweight, 5 ounce package. You are going to get that racing kind of firmness, but found it to be not hard on my legs. Running in the Type A I found them retaining the qualities I liked about the previous models, light, fast, and fun. While the A6 is marketed as a 'racing shoe', I view it as an optimal shoe, providing everything most runners need without the weight that comes with the over engineering of traditional running shoes. The Type A 6 from Saucony is a racing shoe that delivers lightweight cushioning and responsive performance. Meant for neutral runners, it essentially uses minimal features that are still efficient and dependable. Its overall lightweight nature doesn’t drag the foot down and its high quality components even blend well with the natural movement of the foot. The upper unit delivers a reliable and comfortable wrap. This upper cover is secure and breathable, as well. The pliable material used here allows natural flexibility, and the thin overlays assist in hugging the foot snugly. The Saucony Type A 6 essentially offers a no-nonsense covering. High quality cushioning is given by this running shoe. A proprietary mid-sole foam is used, and it gives responsible cushioning, flexibility and durability. The platform is not thick, but it’s reliable and sure in providing plush underfoot support. Durable protection from wear and abrasion is the main purpose of the outsole unit. The surfaces of roads and tracks can be damaging to the sole unit, so a reliable layer of defense is needed for longevity. This shoe uses reliable rubber compounds to deliver protection, as well as added cushioning and responsiveness to the toe-off. The Saucony Type A 6 has a standard running shoe length. It’s available in sizes that adhere to the regular measurements for men and women. It comes in a medium-width version, so it accommodates the runner with a medium-sized foot. The semi-curved shape welcomes the natural curvature of the human foot, allowing the runner to acclimate well to it. The XT-900, which is also present in the Type A8, is a carbon rubber material placed in areas of the outsole that’s prone to wear and tear. It essentially shields the sole unit from the abrasive nature of the surfaces, while also giving traction for responsive surface control. The IBR+ or Injection Blown Rubber is the Saucony outsole rubber compound that adds more cushioning and responsiveness. 33% lighter than most outsole compounds, this liquid molded layer cushions the foot, particularly during foot strikes and toe-offs. The SSL EVA is a mid-sole foam that is lightweight and flexible. The foot stays comfortable because of its plush surface. It even delivers bounce-back mechanics, so the foot stays engaged and each step gets a bit of springiness. It’s also durable, so it lasts long and it doesn’t lose structural integrity easily. The Open Mesh is a soft material that gives a comfortable and breathable coverage. It wraps the foot responsibly, but it doesn’t make the inner environment hot or uncomfortably tight. Air constantly enters the material, so the interior remains well-ventilated and dry. The Flex Film Overlay System is an exoskeletal frame that assists & supports the upper mesh in wrapping around the foot comfortably. It’s hot-melded onto the fabric, so it doesn’t use stitching. Fluid foot movement is accessible because of this seamless upper design.